Founded by professional photographers, A Flying Camera vowed to manufacture real photobooths that take the best photos of any machine out there. And then we went to work. In our professional opinion, no other photobooth takes better photos, period. So, if you want to look good, then you want our photobooths. Secondly, we created machines that look great at your event. 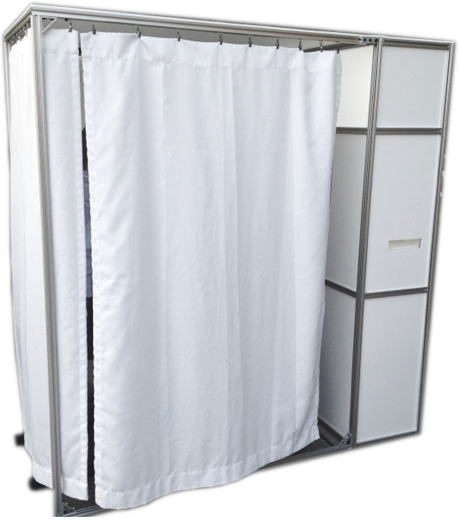 Brushed aluminum accents with either all white or all black panels and curtains, our booths will compliment the decor of your event. Lastly, we created our photobooths to use every bit of technology available. Touchscreens, LED’s, email functions, 7 second print times, and a portable design that will fit in any room yet accommodate up to 13 heads in a photo. That’s making use of today’s technology. 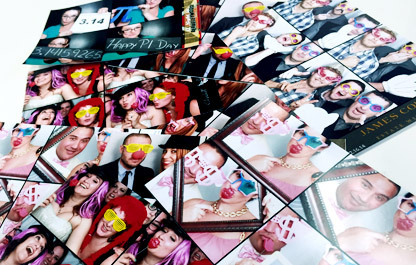 Our Premium Photobooth rentals come fully loaded so there’s no reason to worry about adding or subtracting. After a decade of photobooth rentals, we’ve come to learn that everyone wants all the options, every time. They just don’t want to be charged for every little thing. So, we decided to include it all, every time, and it allows us to buy in bulk and simplify things… and simply put, we give you a better value than anyone because of it. So, here’s the quick list of what’s included with every rental – setup, tear down, full time attendant, custom graphics, props, email function, unlimited prints, website, digital copy of all images, double prints, and a photo guestbook. That’s pretty much everything you can ask for, but if you think of something else, let us know. We have fun at A Flying Camera on a daily basis. But…the “funnest” days are those days we break the rules of modern society and go prop shopping. 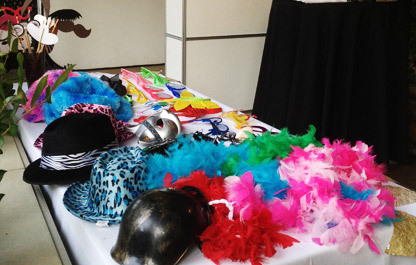 We search far and wide for the best hats, glasses, boas, masks, blow up things, and creative signs. Lips and mustaches for everyone and every occasion. You’re welcome you to add your own things to the mix that you might have in the attic as well. Pretty much anything will work. True story: My 3 year old daughter accidentally dropped her pink sweater in one of our prop trunks before we left to an event, and we found grown men trying to wear it in the photobooth photos. Not sure what to think about that. We buy our supplies in bulk and get an incredible rate on our photo paper. It’s all because we want you to have as many copies as you and your guests are willing to take home. After all, more photos = more fun, right? 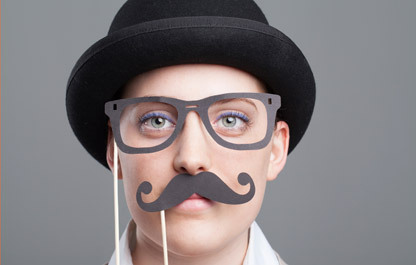 Your photobooth attendant is on the look-out during your event for any guests that would like additional copies of any photo. Just a click of a button and those copies will be coming out of the photo chute in a few seconds. UNLIMITED PRINTS means you get as many as you want, and never charged another dime. Gentle Reminder: Send a photo to your mom, she misses you. OK, so you are throwing this awesome event and everyone is having fun, and hopefully almost too much fun. They wake up the next day, and here’s their photobooth photo. They hang it up on their fridge. 6 months go by, and they look again at the photo and notice the custom graphics around the edge and suddenly realize that it was your celebration that created that memory. Together with your direction and our brilliant graphic artist, we will create custom artwork that will be placed on all of the photobooth images. No one will forget this party. The fun continues on a privately hosted website only for you and your guests to enjoy ALL of your images. Shortly after your event, your photos will be uploaded to a password protected website for your viewing pleasure. Download, share, tweet, Facebook what you want. You can even order enlarged copies of your favorite photo, or maybe you are in need of a new photo mousepad. Not sure if anyone uses those anymore, but you can order them. 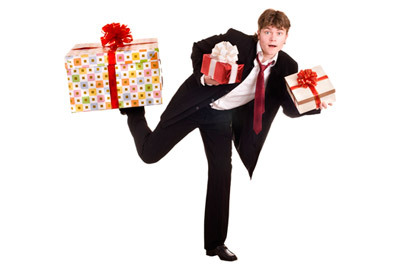 After every event we send out a survey to see how you rate our service from start to finish. We always hope that the world-class service provided by your Photobooth Attendant was the best part. We are constantly interviewing, training, and grooming our attendants to be the most incredible party hosts. Yes, they are technologically talented and keep your photobooth running smoothly all night long. But they are really hired based on their beautiful, fun-loving, life-is-great personalities. They will be your social butterflies creating a party at the photobooth. Ok, time for some selfishness on your part. As the party host, or guest of honor, you do get to keep something from the party. 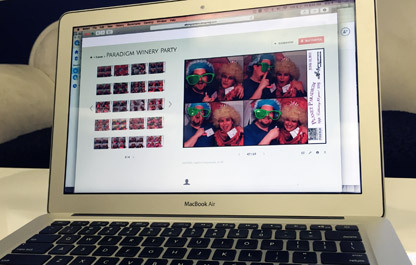 We are going to set the photobooth to print an extra copy of every photo and your attendant is going to grab them and put them into a photo scrapbook. Each and every guest will be invited to sign and write comments next to their images. 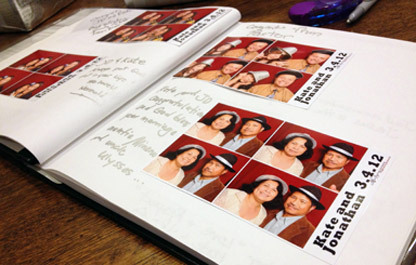 At the end of the event you end up with everyone’s photos in one book, having fun in the photobooth at your party with hand written nonsense of every sort. It’s priceless and random and each book is completely unique. Just a warning though- if the photobooth is at a wedding, the marriage advice written in the guestbook may not actually be good advice.